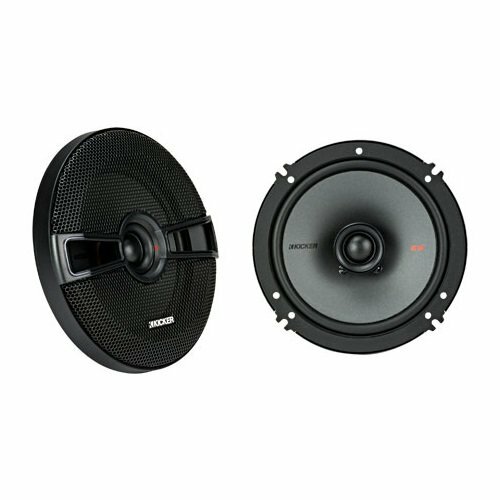 Pair Kicker 44KSC6504 KSC650 6.5" 400 Watt 2-Way Car Audio Speakers KSC65. High Power Handling. Extended Dynamic Range. Silk Dome Tweeters For A Smooth Sound. Polypropylene Woofer And Tough Rubber Surrounds. Thin-Mount Design Easily Fits Behind Factory Grilles. Grilles Included. These KSC speakers work best with 100 watts of recommended power. See below for more details. Specifications: Speaker Design: 2-Way. Woofer: 6-½" (160 mm). Tweeter: ¾" (20 mm). Rated Impedance: 4 Ohms. Peak Power Handling: 200 Watts. Continuous Power Handling: 100 Watts. Sensitivity: 90 1W, 1m. Frequency Response: 43Hz - 21kHz. Mounting Hole Diameter: 4-13⁄16" (123 mm). Top Mount Depth: 1-13⁄16" (46 mm). Bottom Mount Depth: 2-3⁄16" (54 mm). Tweeter Protrusion: 5⁄16" (8 mm). Grilles: Yes. Tweeter Magnet Material: Neodymium. Tweeter Dome Material: Silk. Tweeter Design: Balanced Dome. Woofer Cone Material: Polypropylene. Woofer Surround Material: Rubber. KICKER's coaxial 6 ½-inch upgrade delivers remarkable performance and ultra-clean bass. Fits most GM, Ford, Chrysler, Jeep, Dodge and many imports. The KSC 6-½ Inch Coaxial Speakers are built for awesome sound that plays as long as the ride takes you.